Paris: Shakespeare & Company, 1922. First edition, one of 750 numbered copies on handmade paper from a total edition of 1000 copies, this is number number 347. Thick quarto, original blue and white wrappers. In excellent condition, the volume is square and tight, without marks of any kind, with some some restoration to the spine. Housed in a custom half morocco clamshell box. A nice example. 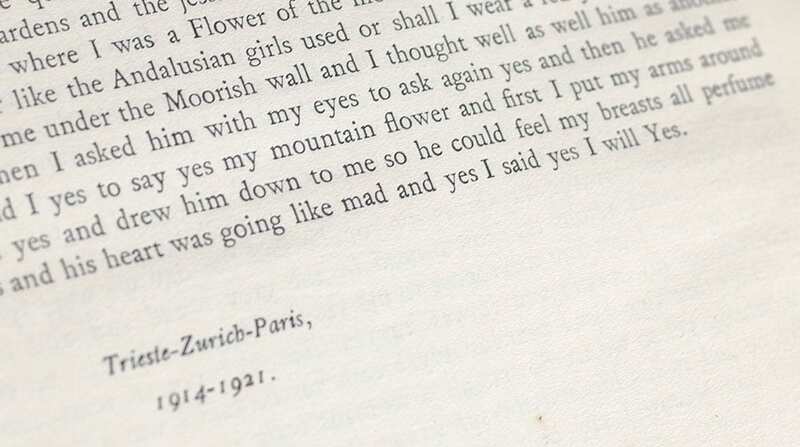 Ulysses was published in Paris by Shakespeare & Company, 1922. It was a struggle for the author to find a publisher, a comic irony considering that Ulysses is "[u]niversally hailed as the most influential work of modern times" (Grolier Joyce 69). Ulysses was an immediate success. 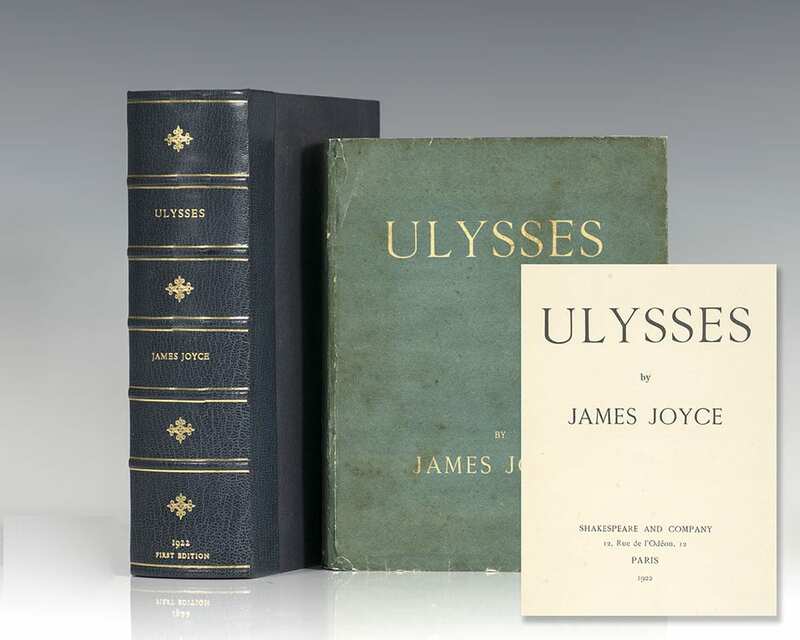 The first printing sold out, and "within a year Joyce had become a well-known literary figure. Ulysses was explosive in its impact on the literary world of 1922" (de Grazia, 27). Even so, the book faced difficulties in global reception. It was banned in the U.K. and was prosecuted for the obscenity in the Nausicaa episode (Ellmann, 1982). Joyce's inspiration for the novel began as a young boy reading Charles Lamb's Adventures of Ulysses and writing an essay entitled "My Favorite Hero" after being impressed by the wholeness of the character (Goreman, 1939). 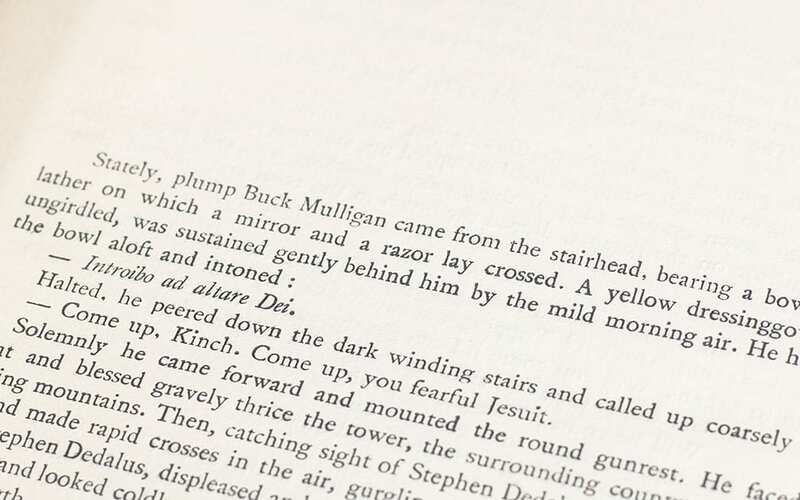 The idea for the novel grew from a story in Dubliners in 1906, which Joyce expanded into a short book in 1907, before reconceptualizing it as the heady novel in 1914 (Ellmann, 1982). The book can initially seem unstructured and chaotic, and Joyce admitted that he "put in so many enigmas and puzzles that it will keep the professors busy for centuries arguing over what I meant" (The Observer, 2000). The French translator Stuart Gilbert published a defense of Ulysses shortly after its publication in which he supported the novel's use of obscenity and explained its internal structure and links to the Odyssey against accusations of ambiguity. Every episode, Gilbert explained, is connected to the Odyssey by theme, technique, and correspondence between characters. Another instance of Ulysses' literary contribution is his use of stream-of-consciousness, a technique employing carefully structured prose, both humorous and charactering, and involving puns and parodies. Joyce was a precursor to the use of stream of consciousness in the later decades. Similar narrative techniques were used by his contemporaries Virginia Wolfe, William Faulkner, and Italo Svevo. Their style can be better characterized as an "interior monologue, rather than stream of consciousness, is the appropriate term for the style in which [subjective experience] is recorded, both in The Waves and in Woolf's writing generally" (Stevenson, 1992). The first Cape edition with reset type. Octavo, original cloth. Near fine in a very good dust jacket with some light reinforcement to the verso at spine tips and loss at foot of spine. With original extract notes laid in. Rare in the original dust jacket. First edition, one of 750 numbered copies on handmade paper from a total edition of 1000 copies, this is number 992. Thick quarto, original blue and white wrappers. A near fine example, internally fresh and largely unopened, completely unrestored. Housed in a custom half morocco clamshell box. This example contains the original prospectus with the tipped-on reproduction of the 1918 photo of Joyce by C. Ruf. The front panel of the prospectus has been amended, as often, to indicate the book “is now ready,” and the original buyer must have jumped at the opportunity, as the order panel of the prospectus has been neatly cut away. Sisley Huddleston’s 5 March 1922 review from The Observer is also laid in (though both items are in prophylactic sleeves that have prevented any offsetting). Also laid into the slipcase is some correspondence relating to the sale of this copy in 1972 by Duschnes in New York City. An exceptional example with noted provenance. Paris: Shakespeare and Company, 1922. First edition, one of 750 numbered copies, this example is number 282. Quarto, original blue wrappers as issued. Association copy, inscribed by the author on the half-title page, “To Lewis Galantiere James Joyce Paris 11 February 1922.” Ulysses was scheduled for publication on Joyce‘s fortieth birthday (February 2, 1922), but only two copies were ready on that date due to technical difficulties in printing the cover, the color of which Joyce wanted to match with the blue of the Greek flag. One of these was the copy delivered by Sylvia Beach to Joyce on February 2, which he then inscribed to his wife Nora, being the only known presentation copy to predate Galantiere’s. The present copy in turn predates by two days the three copies presented to Sylvia Beach, Harriet Shaw Weaver and Margaret Anderson, and by three days the copy inscribed to Robert McAlmon, who helped Joyce prepare the final typescript. Galantiere was an American translator of French literature, writer, playwright and journalist. From 1920 to 1927 he was secretary of the International Chamber of Commerce in Paris, and came to know most of the literary figures of the day, including Hemingway. In a letter to Harriet Weaver of 17 April 1926, Joyce writes: “I am to read [from Finnegans Wake] … to a small group, this time including … a young American Galantiere who is preparing a course of lectures of Ulysses” (Joyce Letters vol 3, p 140). Slocum & Cahoon A17; Connolly The Modern Movement 42. In excellent condition with light rubbing, rebacked without the folding flaps. With Galantiere’s marginal markings in pencil and in ink. Housed in a custom full morocco clamshell box. An exceptional rarity of this twentieth century milestone. London: The Egoist Ltd, 1916. 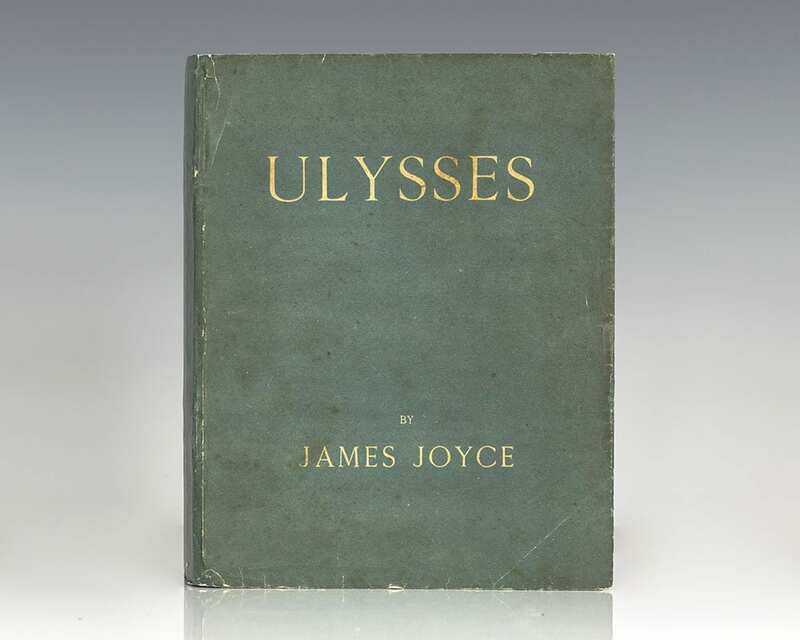 First English edition, one of approximately 750 copies of Joyce’s classic stream-of-consciousness work, his first novel. Octavo, original cloth. In excellent condition with light rubbing and wear. 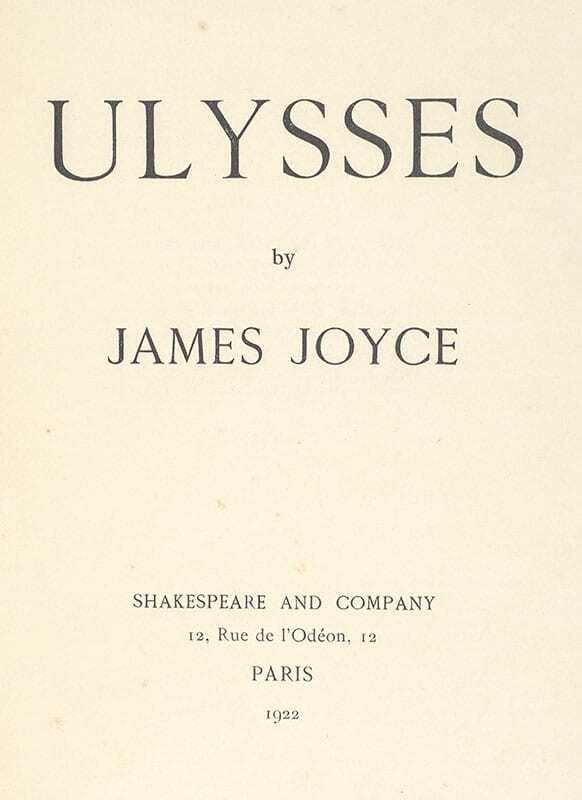 First authorized American edition of Joyce’s masterpiece. Octavo, original white cloth. Fine in a fine first state dust jacket with Reichl on the bottom corner of the front panel with some rubbing and wear. Jacket design by Ernst Reichl. London: Faber & Faber, 1939. 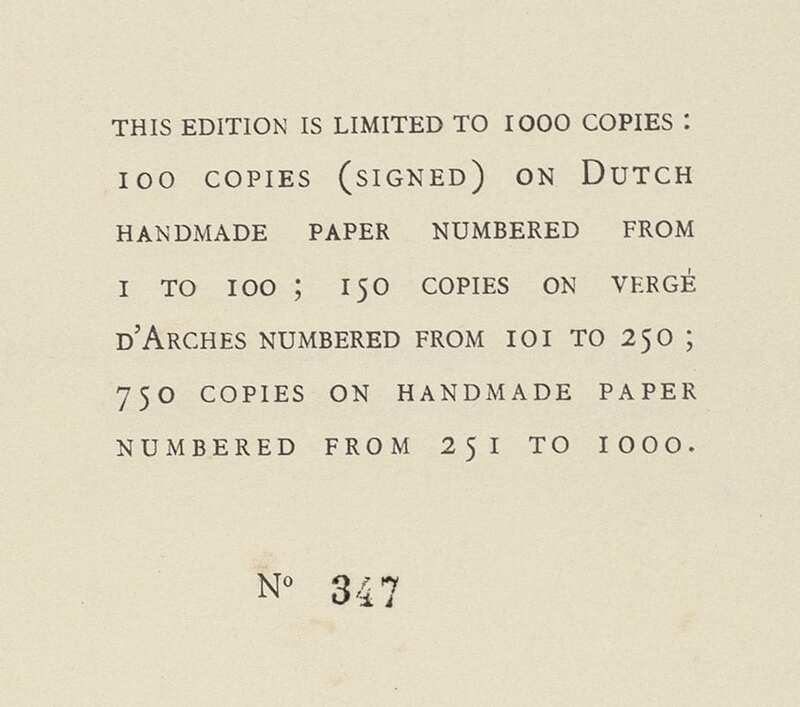 First signed limited edition, number 251 of only 425 large-paper copies signed by Joyce. Octavo, original red cloth, titles to spine in gilt, top edge gilt, original publisher’s yellow cloth slipcase. Signed by James Joyce on the limitation page. In fine condition, with the publishers slipcase. Housed in a custom half morocco clamshell box. A superior example. 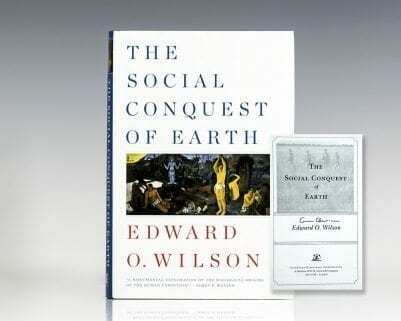 First American edition, one of 6000 copies printed. Octavo, original cloth. A review copy with a letter from the publisher laid in, near fine in a near fine dust jacket. An exceptional example. First edition of Joyce’s classic stream-of-consciousness work, his first novel. Octavo, original blue cloth with titles to the spine in gilt. In excellent condition without the usual fade to the spine. From the library of Henry W. Keyes, with his signature to the front free endpaper along with his daughters. Keyes was the Governor of New Hampshire and a United States Senator and married to the writer Frances Parkinson Keyes. Housed in a custom half morocco clamshell box. A nice example with noted provenance. Allais, Maurice (Kenneth J. Arrow). First edition of Allais’ groundbreaking work. Octavo, 2 volumes, original wrappers as issued. Inscribed by Maurice Allais on the title page of volume one. From the library of fellow Nobel Prize-winning economist Kenneth Arrow, with his name in each volume. In near fine condition with light shelfwear, minor mending to the first few pages of volume one. A nice association linking these two Nobel Prize winning-economists and giants of twentieth century economics.